A group of Peruvian writers has condemned a decision by the authorities to pardon former president Alberto Fujimori on health grounds. Among the writers who signed the letter is the Nobel Prize-winning author Mario Vargas Llosa. President Pedro Pablo Kuczynski pardoned Mr Fujimori last Sunday. The former leader was serving a lengthy prison sentence for human rights abuses and corruption during his time in office in the 1990s. The writers, who sent a signed letter to the Spanish news agency Efe, said President Kuczynski's decision was illegal and irresponsible. They called it a disgrace for Peru. On Thursday, a group of United Nations human rights officials called it a slap in the face for victims of Mr Fujimori's government. 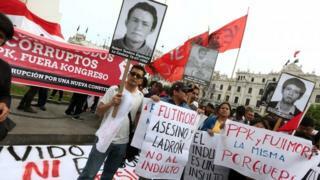 Thousands of people have taken to the streets in Lima and other cities to protest against the decision. Mr Fujimori's critics consider him a corrupt dictator. Earlier this week, Mr Kuczynski acknowledged the anger triggered by his decision but said he could not "allow Alberto Fujimori to die in prison". Supporters of the former leader say it was a humanitarian gesture. They praise him for combating Maoist rebels of the Shining Path movement in the 1990s.